A recent urban kitchen refurbishment with beautiful white oiled oak, plywood cabinet fronts. 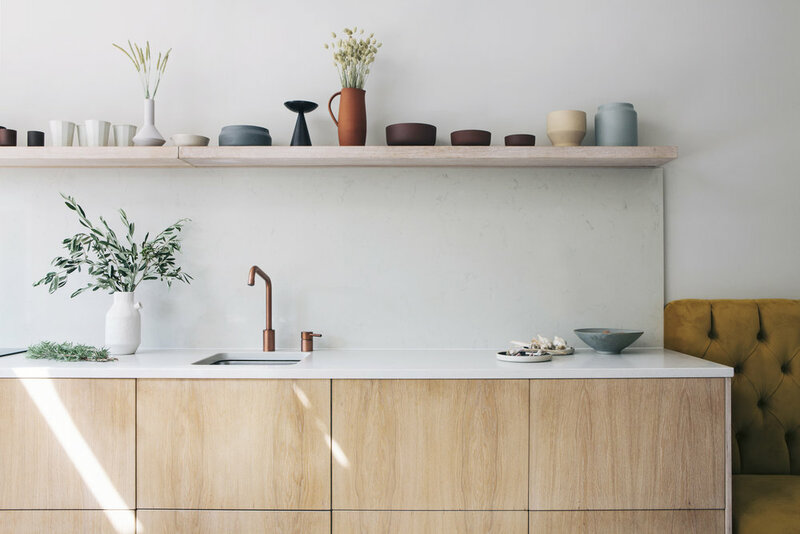 A clean, minimal style with simple aesthetics that lend themselves to a modern, family kitchen. The calming colour palette and contemporary design created a pleasing environment, more suited to socialising and family practicalities. The original oak floor was sanded back and treated with a white oil to refresh and lighten the space. Tactile velvet was used alongside natural wood, fuss-free cabinetry and stone worktops giving a practical space a more harmonious feel. Designed by Hannah Gooch Studio.